This is Kuwait’s Pompei…. 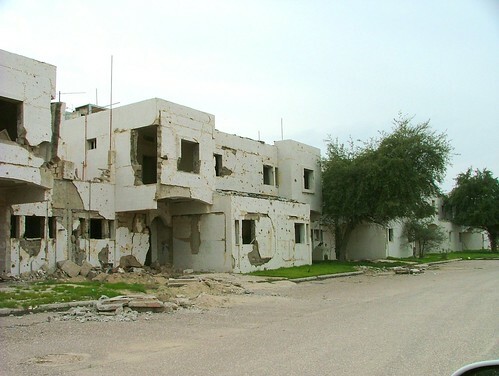 The houses and neighbourhoods are as they were left in 1990 after the invasion. We drove around to get a feel of what life used to be like here (this was amazingly my first visit) and many had signs of the invasion (some of the bullet holes may have been caused by training after liberation as the island was a military area for a long time). Failaka is now under many studies and some companies have full plans of what its future should look like. I have personally seen plans that a friend has been working on to build a whole touristic village in Greek style. It will have the largest (and most proffessional) health spa in the Middle East as well as hotels, restaurants and shopping malls. I hope to see it materialise before long…. Talking and drawing is easy! Update 15 02 2008: The plans are cancelled and the company has pulled out of the project because of lack of cooperation.